was preceded in death by his parents, Robert H. and Margaret Allen, and brother, Robert K.
sister Mary Beth Allen of Webster, NY; and sister-in-law Evalyn Allen of Webster, NY. and lead him to a lifelong love for adventures in the outdoors. Big Sky records. Dave graduated from UM with a Bachelor of Science in Health Enhancement. Bozeman and Cody, WY. In 1989, he started his teaching career at Billings Public Schools. levels. He was well known for inspiring and motivating his students, as well as for his creativity. Once for class, he taught his elementary students to build igloos on the playground! and telling tall tales around the campfires. Dave will forever remind us of his heart; full of strength, optimism, and love. Life is good in Montana. A celebration of Dave’s life will take place in Summer 2019. To send flowers in memory of David J Allen, please visit our Heartfelt Sympathies Store. Provide comfort for the family of David J Allen by sending flowers. It is wish such sadness that I hear of Dave's passing. Talk about a guy who lived life to the fullest, what an inspiration. 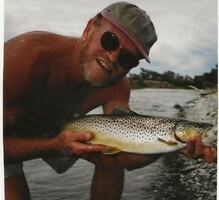 I still remember his fly casting instructions and his insistence that I not rock the boat. I was mesmerized by his stories and wisdom, Dave was always willing to share his wisdom and knowledge. I still can see him on the Horn or Yellowstone with his trusty dog as his pilot.